Ever watched a horror movie and wondered how those squelching, stabbing, screeching shrieking sound effects are made? Wonder no more. This surreal, weirdly disturbing film tells the tale of Gilderoy (the marvellous Toby Jones), a British sound engineer invited to the eponymous Italian studio to soundtrack a lurid 1970s Dario Argento-style horror movie entitled The Equestrian Vortex. With his prim shirt and tie and somewhat autistic British reserve, sad bloodhound eyes and eloquently quivering jowls, Gilderoy is your ultimate fish out of water amidst the louche, blasé Italians, and he finds himself increasingly uncomfortable with his involvement in what turns out to be a rather nasty production. Why this seeming unknown who makes nature documentaries from his garden shed has been summoned to Rome to soundtrack a horror film set in a bedevilled riding academy is never explained. Is it some dark Satanic conspiracy to drive him mad? 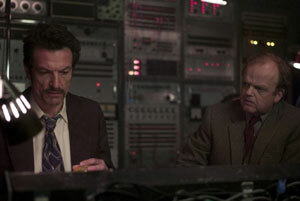 If so, it’s a resounding success, as the relatively straightforward narrative suddenly veers midway into torrid, subtitled nightmare reminiscent of John Carpenter’s Cigarette Burns and, well, the very films Berberian Sound Studio both celebrates and derides. And, of course, it lays bare an encyclopaedic understanding of deliciously stomach-churning sound effects, mostly created, it transpires, from random violence to vegetables, the rotting corpses of which gradually accumulate and moulder as the film progresses, decaying as alarmingly quickly as poor Gilderoy’s mind. 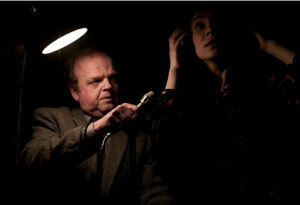 Berberian Sound Studio is an odd film, part life-imitating-art meta-movie, part pure horror soundscape; absorbing but occasionally baffling, its refusal to explain anything as intriguing as it’s frustrating. But for sheer unadulterated 1970s, synth-tastic, atmospheric creepiness it takes some beating.